A Peek Behind the Curtain of College Pricing | The College Funding Coach A Peek Behind the Curtain of College Pricing | Paying for college without jeopardizing your retirement! One of the biggest problems in planning to pay for college is that most parents simply don’t understand the rules of the game. And it’s not as if the colleges are doing a great job of teaching us the rules—they’re not! It reminds me of the time I was told by a friend who is a Certified Public Accountant that a taxpayer could send all of his tax information to the Internal Revenue Service and they would diligently prepare a tax return. Yet, somehow the accounting profession still thrives—there is a reason why! The same is true for college funding—the colleges don’t want you to know the rules. We do. College is big business. For many families, the first time they start thinking about a strategy to pay for college, their oldest child is a high school junior or senior. Unfortunately, that may be too late. The key is understanding the rules and formulas, and taking action. It’s no secret that many institutions of higher learning have significant war chests in their endowment funds. You can check out the full list, as reported by the National Association for College and University Business Officers (NACUBO) here. 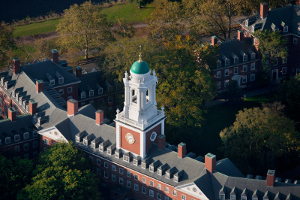 For example, at the end of 2012, Harvard University had over $30 Billion in their endowment. The Cost of Attendance at Harvard is $62,950. With $30 Billion in their coffers—if we assume that they could earn 5% on this money—Harvard could cover the cost of attendance for every one of their students (21,225 in 2012-13) in perpetuity. Yet, Harvard still charges over $60,000 per student, per year. Why? Because they can. There are many families who can and will gladly pay $62,950 per year for a prestigious Harvard education. If your family can afford this expense, then Harvard will gladly take your money—via check, credit card or automatic bank draft—your choice. However, if you can’t afford this expense, Harvard has a $30,435,375,000 balance in their checkbook. In other words, if you have the brains, but not the bucks, Harvard still wants you. Unfortunately, many parents still look at the sticker price when considering their ability to pay. When buying a car, this makes sense. When paying for college, nothing could be more misguided. As an example, this past year, The College Funding Coach worked with a family from Ohio whose son was considering two very different Midwestern universities—Grinnell College in Iowa and The Ohio State University. Grinnell is a very interesting college with lots of history…and lots of money. In 2013, they have 1,688 students and a $1.4 Billion endowment. On the other hand, Ohio State is one of the largest universities in the country with 64,429 students across all campuses. 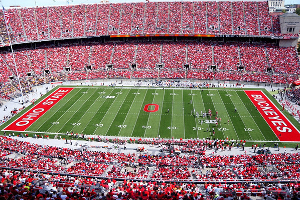 Ohio State’s endowment had roughly $2.4 Billion at the end of 2012. I realize that a billion dollars is a large rounding error for you and me. But for colleges, it’s a different story. A college like Grinnell can stretch their budget further than Ohio State can. The first term with which to familiarize yourself is the Cost of Attendance. Every college publishes a Cost of Attendance figure. This includes tuition, room & board, books, fees, personal and travel expenses. It is your cost all-in. 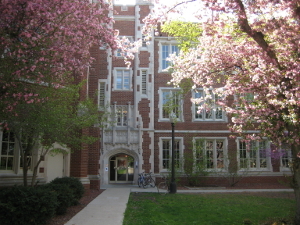 Cost of Attendance at Grinnell is $53,318, while it’s only $25,886 for an in-state student at Ohio State. The second term to know well is Expected Family Contribution. This is the amount that the colleges expect you to be able to pay on an annual basis. You can calculate your EFC here. 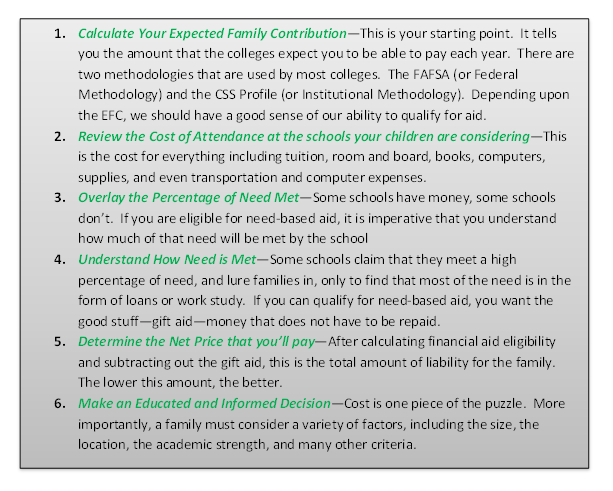 As you look at colleges and consider their financial aid packages, it is important that you understand gift aid versus self-help. Gift aid is other people’s money—grants and scholarships that do not have to be paid back. Self-help is loans and work study programs—money that somehow, someway has to be paid back. This is a great example how a family can take a school that, on paper, is more than double the Cost of Attendance of another school, and still pay less out-of-pocket. Because Ohio State is only able to meet 69% of aid, that’s our first red flag. Then, because they only meet 46% of this aid in the form of free money, that’s a second red flag. We’re not picking on Ohio State—it’s a great school with tons of tradition. For purposes of this discussion, it’s simply math. When we work through this formula, the Ohio State option shows us that the family is eligible for $7,511 of need-based aid. $3,455 will be in the form of grants or scholarships, and the remaining 54%, or $4,056 will be in the form of a student loan. To clarify, the “Out-of Pocket Cost” is the Cost of Attendance minus the financial aid eligibility. For the True Cost (often called the Net Price), we add back in the self-help, because this is essentially your money. It’s paid to the university in the form of the student working at the library or in the chemistry lab, or in the form of student loans that have to be paid back with interest. 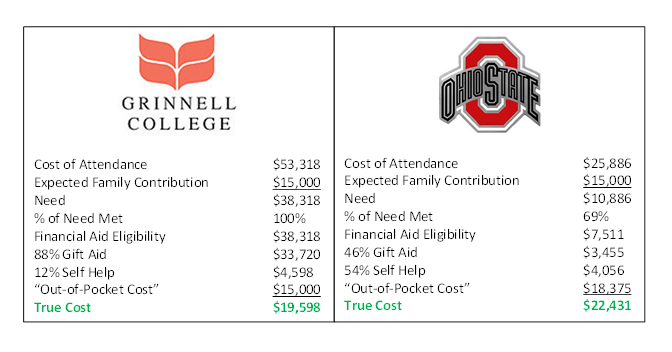 In the final analysis, the true cost to the family is $19,598 at Grinnell and $22,431 at Ohio State. Because Grinnell is a better fit for this particular student, we love that we were able to show this family how to make it all work, especially since they definitely won’t be paying sticker price when their son enrolls at Grinnell this coming fall, and we think that’s pretty cool! Choosing the right college hinges on a variety of aspects. The price is clearly important; but it may not be the most important consideration. The best analogy may be that of an airline: if a traveler went to Dulles International Airport to board a flight leaving in an hour bound for Los Angeles International Airport, and the flight was not full, the airline should take whatever they can get for that seat—the flight is leaving whether he is on board or not. The same is true for colleges—they have to offer enough financial aid to lure the family to make a commitment, and not a dime more. It’s a fine line; but we believe that it is a critical area worth understanding. Some colleges are very good at giving money, and others are not so good. Take your time, do your homework, and make an educated and informed decision. Your financial future may be riding on it!